Ralph DuPae kindly put me in touch with John Hartford who signed his name with vintage style on this photo of himself steering the Julie Belle Swain (scroll to the right to see autograph in uppler right hand corner). 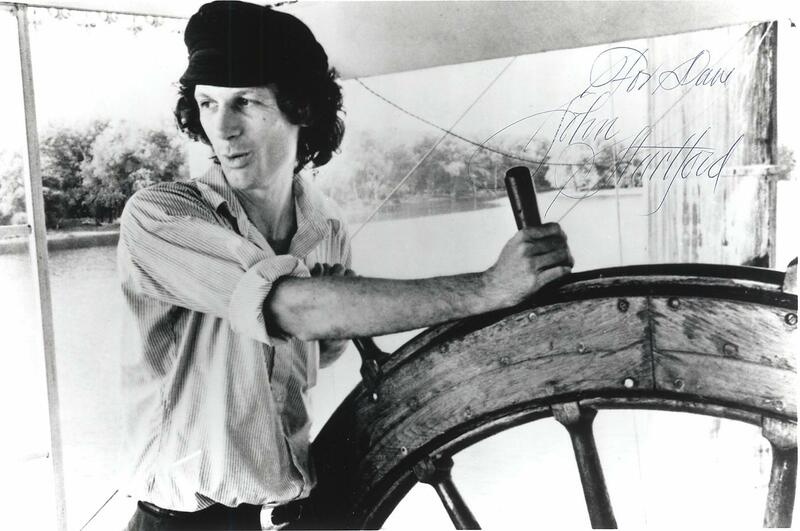 John Hartford in the Julia Belle Swain pilothouse. Jim Hale took the photo on a fall foliage cruise on the Tennessee River out of Chattanooga, November 1974. 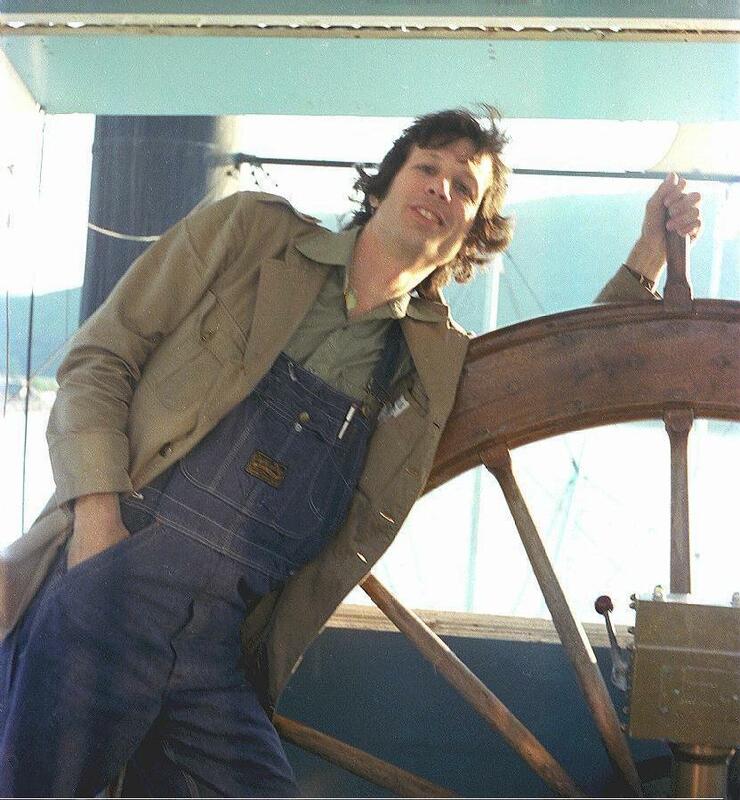 Go to Jim Hale's page to see a photo John Hartford took of him the same day in the Julia Belle Swain pilothouse - click here. Came across this online . 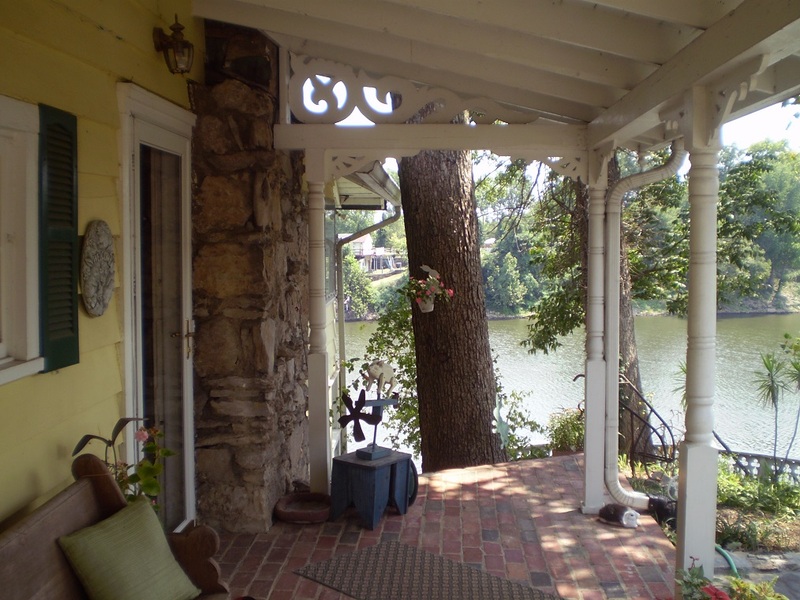 . . comfly cozy front porch of John Hartford's home on the Cumberland River. What an ideal setting! This site is dedicated to the collection, preservation, and promotion of history and culture in my section of Appalachia. Brandon Ray Kirk, author of Blood in West Virginia: Brumfield v. McCoy (Pelican, 2014) and a descendent of feudists from Lincoln County, West Virginia, is an enthusiast of Appalachian feuds, Southern violence, timber history, and traditional Appalachian music. An assistant professor of American history at Southern West Virginia Community and Technical College, Kirk gives daily lectures about Appalachian history. In addition to having written scores of Appalachian-themed articles for regional newspapers and books, including the West Virginia Encyclopedia, The Kentucky Explorer, and Goldenseal magazine, Kirk has contributed to the PBS series West Virginia and offered expertise for participants in the History Channel series Hatfields and McCoys. He has also lectured for the Scarborough Art and Lecture Series, the Lunch with Books program at the Ohio County Public Library, and the West Virginia State Archives &History Library. His diverse career has included working as a university library assistant at Marshall University's Morrow Library Special Collections Department, writing for the Lincoln (WV) Independent and Lincoln (WV) Journal, researching and writing for Hartford Music, Inc., writing for the Logan (WV) Banner, and teaching advanced placement history courses for Lincoln and Logan County Schools. He has worked extensively with Representative Ken Hechler's Congressional papers, partnered with West Virginia Hillbilly editor Jim Comstock, and archived the papers of CBS executive Bob Tamplin. A close associate of the late John Hartford, Kirk co-authored the Ed Haley biography and assisted with the Grammy Award-winning soundtrack O Brother, Where Art Thou? He is a Blake-Hulse Scholar and a past member of Kappa Delta Pi and Phi Alpha Theta honor societies. More recently, Kirk has appeared in Smithsonian magazine and The New Yorker magazine as well as on The Friendly Neighbor Radio Show and the TV program Chapters. Governor Earl Ray Tomblin appointed him to serve on the West Virginia Civil War Sesquicentennial Commission. He also contributed to an upcoming John Hartford documentary. In 2015, The State Journal chose him as one of "55 Good Things About West Virginia." Appalachia from his home in Harts, West Virginia. 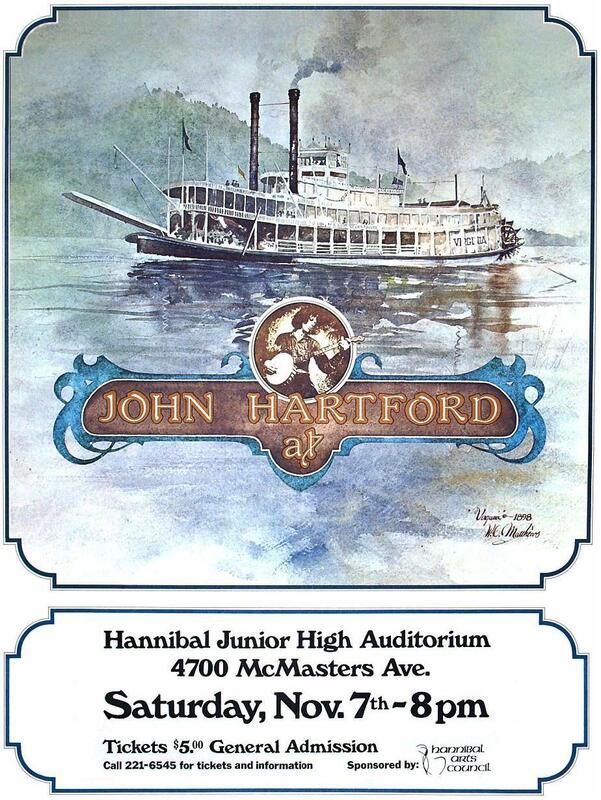 Here's a poster for one of Hartford's live appearances in Hannibal, Missouri, by theHannibal Arts Council. The poster must refer to Saturday, November 7, 1981. The same artwork was used for an album cover. Link to John Hartford's music and photos of John Hartford by Bill Muster (at this site).